Paytm Cashback Loot, Free Paytm money wallet, Paytm Upi Cashback Offer – Hello everyone, Now get free Rs. 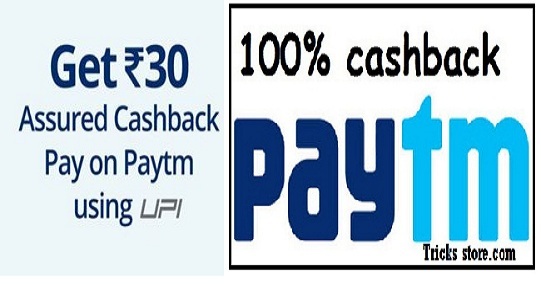 30 cashback on paytm app, when you make a payment Online via Paytm with your Paytm UPI address. Paytm is giving free cashback on recharge or any transaction on paytm. You will get free cashback on paytm of rs 30 on daily basis till 30th April 2018. So if you do daily Recharge or buy Gold Of Rs.30 Once in a day With PayTM UPI Address & You Will Get 100% Cashback in your Linked Bank account in Paytm app/web. Note – Now they Are giving free 30 rupee cashback in Every month offer updated on 25th April. Note – If you haven’t create your Paytm UPI Adreess yet Plz follow Below steps otherwise go to Step 7. 5) After this, Paytm will send a SMS from your Mobile number to verify your Bank account. 7) That’s it now make any Recharge of Rs 30 or more on Paytm App and time of payment choose “BHIM UPI” and Enter your @Paytm VPA address to complete payment. Yippee! You will get your Cashback within 2-3 days of successful transaction. Now repeat these above Steps daily Till 30th April to get Free Rs.30 Recharge once in a day. * Offer applicable on payments made on the Paytm app and website. Example – Purchasing an item from Paytm Marketplace, purchasing deals, recharges, Paying your utility bills, booking flight tickets etc. * Offer not applicable if you add money to wallet or savings account, send money to friends, scan QR code and pay through upi on any Paytm accepting merchants. * Offer not applicable on payments made on third party platforms using paytm upi address. * Cashback will be credited within 2 working days of completing the transaction.